Hello, sewing and fashion friends. I took a little time off–off from sewing, and off from blogging, off from reading blogs about sewing (or anything, really). I look forward to catching up, and to giving my sewing room the cleaning-out it needs so I can get started again. In the meantime, I received the most wonderful shipment in the mail: my copy of the long-ago pre-ordered book, Gertie’s New Book for Better Sewing. It’s a delightful, beautiful book. I particularly love these illustrations, done by Sun Young Park. They’re part vintage pattern cover art, and part modern fashion illustration, and wholly contemporary and perfect for the subject of the book. I’m going to assume you know about Gertie’s blog, and all the background, and that her book is about using couture techniques from vintage sewing in modern versions of retro styled pieces, and just tell you instead why I, personally like this book. First, though, I should confess that I have no patience for vintage couture sewing techniques. As you’ve seen, I am an “instant gratification” type of seamstress all the way. I have a short attention span, flit from project to project, and am the target market for all the “two hours or less” projects and patterns ever published. I once signed up for an online sewing class on improving techniques through learning couture methods (yes, that one) and I watch all of half of one lesson. Half. Once I saw the recommendation for hand-stitching the muslin, I was out. I love my sewing machine, it makes things go fast. Hand-picked zippers? I have no interest. I get bored with a project far too often just between muslin and fashion fabric…if, in fact, I bother with a muslin at all. Patience, it is not my forte. When I see someone hand-stitching their seam-finishing, I want to scream “That’s on the INSIDE! No-one will ever SEE it! It’s not holding anything together!” I have never, and might not ever join one of the millions of online conversations about the beauty of a well-finished buttonhole. The magic of sewing, for me, lies elsewhere. Which means, in short, that I might not even have the patience to read all the chapters of this book, let alone try one of the projects. 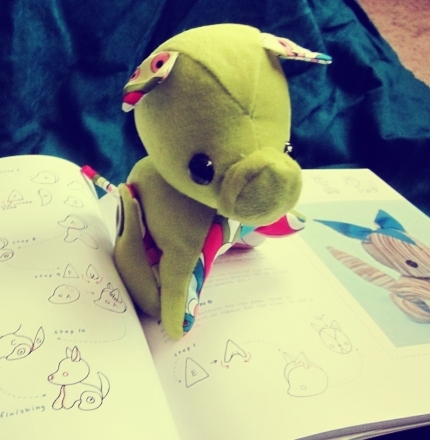 (Patterns are included with this book, in sizes from 32″ to 46″ bust.) For me, this a sewing cookbook. I have a whole shelf of cookbooks and I generally use no more than three of them for actual propping up in the kitchen and following along to make a meal–the three where all the recipes have ten ingredients or less, and whose meals are based around ingredients which I already stock in my kitchen. If I have to go to a specialty market and ask for food items I can’t pronounce, it’s unlikely that I will ever accomplish any of those recipes in my own home, unattended. Sewing is the same way, although I do like to try new techniques (one by one) and experiment with new gadgets (like my recent excursion in home-made bias tape). But I also like to peer into how other people do things, in both their kitchens and their sewing rooms. Gertie has given, in this book, as she does in her blog, a really good window for how-to voyeurs like me. She gives good, clear pictures and simple illustrations so that if one day I really do want to do a faced horsehair hem, or bound buttonholes, I will have them in one place, on my bookshelf. The very best part of this book, for me (beyond the beautiful projects and the retro styles, which of course I love) is that she displays her projects inside-out. “Here, come look at what I’ve done,” this says. If I never use a Hong Kong seam, at least I have a reference on hand for what it might look like, if I did. And seeing a horsehair braid used as a stabilizer in a skirt waist, from the inside, I can understand why that might be a useful step, and maybe one day might be tempted to try that one, myself. So there’s a strong bit of fantasy to it, as with my gourmet cookbooks: some day, I might be the kind of seamstress who stabilizes waists with horsehair braid, or the kind of chef who has time for dumplings. But my turning everything inside-out, Gertie makes it seem not so difficult, after all, and maybe worth trying, one step at a time. But until then, I will enjoy the lovely photos of multiple variations on each pattern provided, the encyclopedic illustrations of techniques I might have elsewhere in my sewing library (like the old swayback adjustment) but still appreciate seeing again. 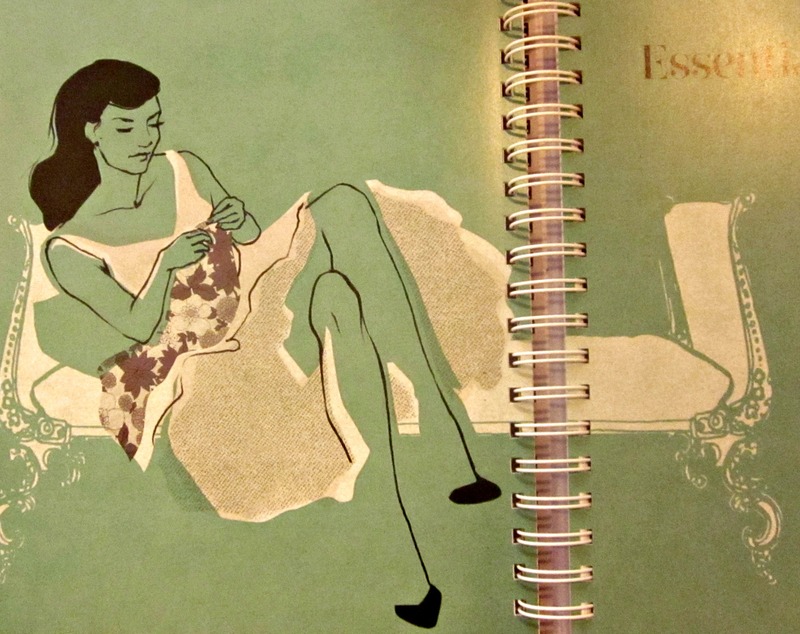 On of my favorite books from my vintage sewing collection is from 1971, called “The Perfect Fit”. It purports to be the last word you will ever need on pattern making and personal clothing design for the home sewer. 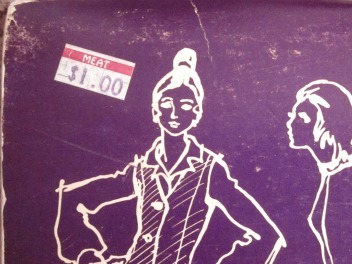 “Meat, $1.00”. Nothing says “DIY greatness” as much as an oddly repurposed grocery store price tag. 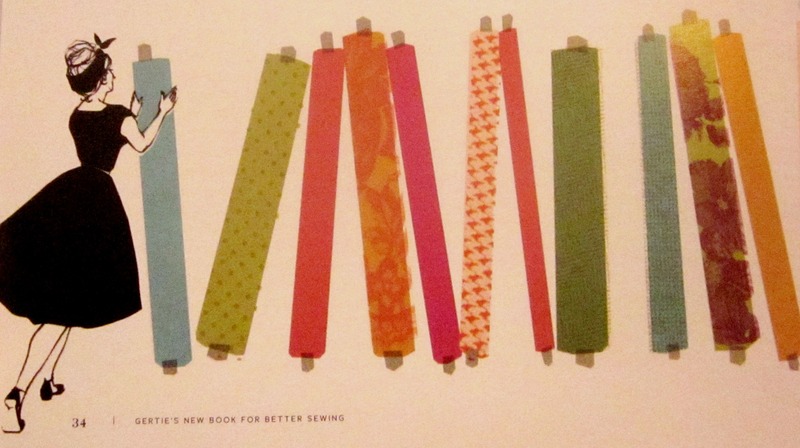 Anyway, the “Perfect Fit” system is essentially one by which a home seamstress has a series of small pattern pieces representing a variety of essential “block” or “sloper” pieces, which she will be able to enlarge into full-sized patterns using punch-out cardboard tools, conveniently provided at the end of the book. You see here how there are carefully angled lines at the key points of each pattern shape, and multiple radiating lines for each curved pattern line. 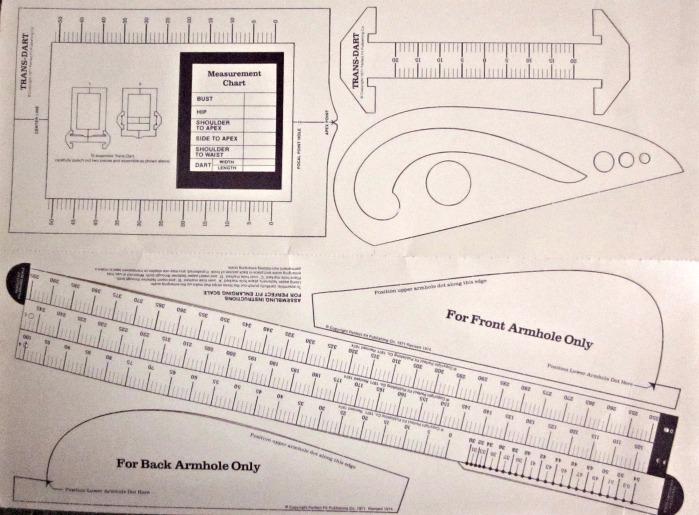 The idea is to lay your cardboard punch-out rulers (from the back page of the book) along each line, extending out to a determined point on that ruler (guided by your body’s own measurement), make a dot on your pattern paper, and continue around until you’ve transferred all the points, one at a time, to your pattern paper. At which point you simply connect the dots, and have your own, custom, perfectly fitting pattern piece for the corresponding little drawing. I’ve always wanted to try it, but I like my tools all neatly held together with their paper tabs. 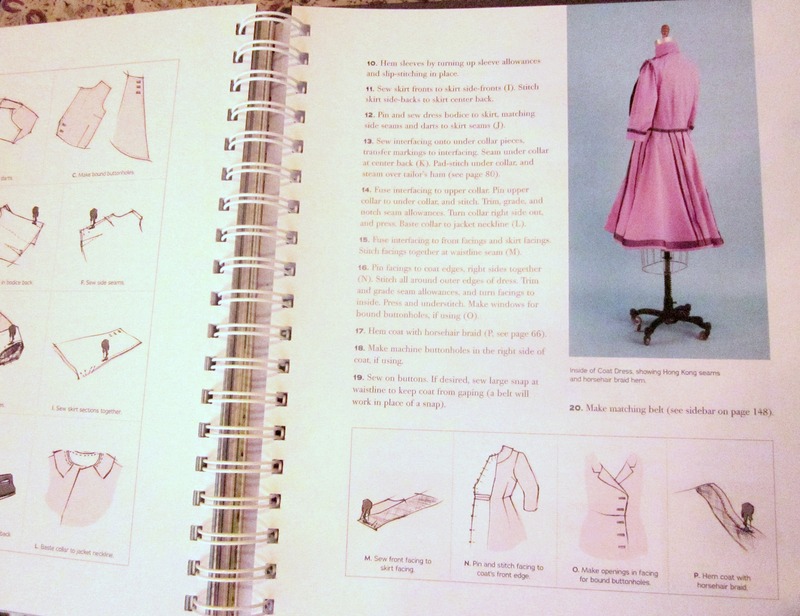 In spite of its failure to deliver on “easy to understand sewing techniques”, the book does offer a good number of basic pattern drafting techniques, and does lay out some good basic design fundamentals, providing simple shapes and then good advice on things like how to move darts, or convert a bodice to princess seams. 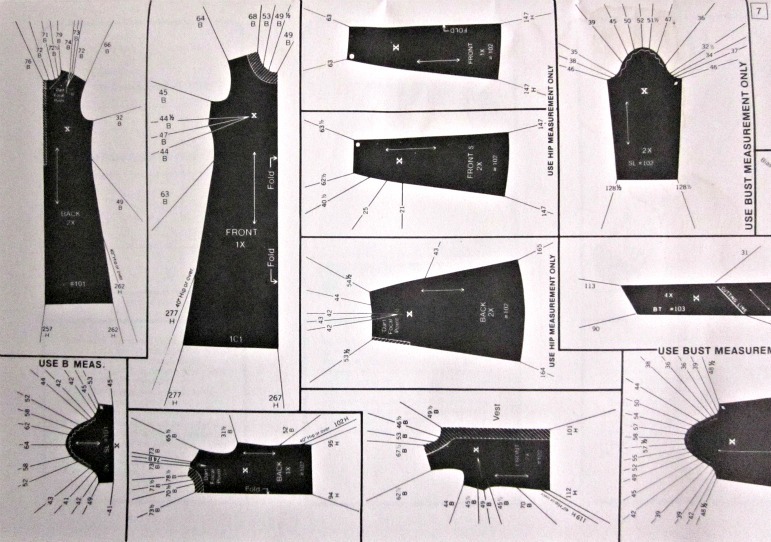 The best part, though, is that it provides good templates of basic clothing (dress, blouse, pants, skirt) and then neat line drawings of many ways those shapes can be customized by adding different sleeves, collars, pockets, belts, lengthening and shortening hems, and choosing different weights and styles of fabrics. A pincushion, after all, is just a little pillow of fabric to stick pins into. I could use any old scraps. But just a plain pillow (or tomato-shape) didn’t seem exciting enough. I looked up patterns online, and discovered that there are roughly 19,500 patterns for pincushions, and about half of those are cupcakes. Adorable! But my fabric scraps weren’t saying “cupcake”, exactly, and then I realized another thing: I don’t need any new patterns, I have tons of those, already, too. 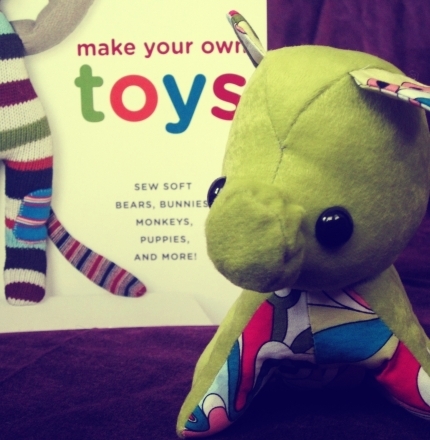 And that’s when I remembered my friend Sue Haven’s book, Make Your Own Toys. I’ve been meaning to try out those patterns for a long time, maybe I could find a sort of squat, square choice, and make it up, and use that as a pincushion. How much more charming would that be, on my work table, to look over and see a happy scrap animal than just a plain red tomato, or even a charming cupcake? I weighted her legs and bottom with dried beans so that she’ll sit upright, and also so if my cat (or my elbow) sends her tumbling to the floor, she’ll likely land right side up. This was a fun little project to sew, and I was glad to have a chance to actually make something from this book. Pincushion Pig might be a bit overcomplicated, as pincushions go, but it gave me trial run for toy patterns, and now I might just make a few more of these in various sizes for some of the children I know. The tail, after all, reminds me of a mouse, and I think it would be very easy to take the same basic pattern and turn it into a mouse…or a whole family of them, perhaps. 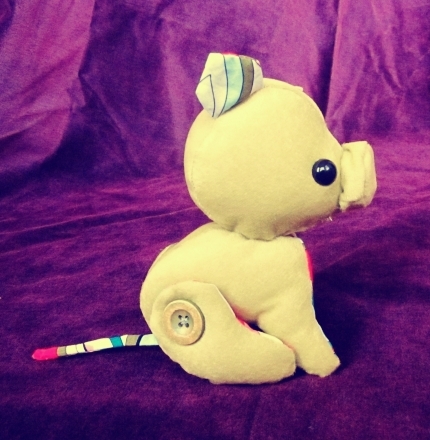 Pincushion Pig does work very well as a pincushion, as well…but the photographs of her with pins sticking out of her back all akimbo seemed somehow brutal and inappropriate for the internet. You’re just going to have to take my word for that. 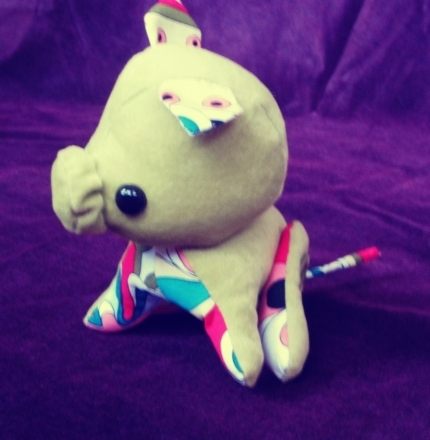 Sue Haven’s website is here, if you’re looking for more crafty toy inspiration. I’d also recommend this completely adorable video on how to make your own Patchwork Flat Bear–also good if you’re just trying toymaking for the first time. Old sewing manuals are fascinating to me. People have been sewing clothes forever, and writing about the process for just as long, and I’ve always loved the way sitting at my sewing machine makes me feel connected to my mother, aunts, grandmother, great-aunts, and all the generations of women who have gone before, making clothes for themselves all the way. Through vintage sewing guides, I can peer back and see exactly how things worked out, back then. And often I find that very little has changed. 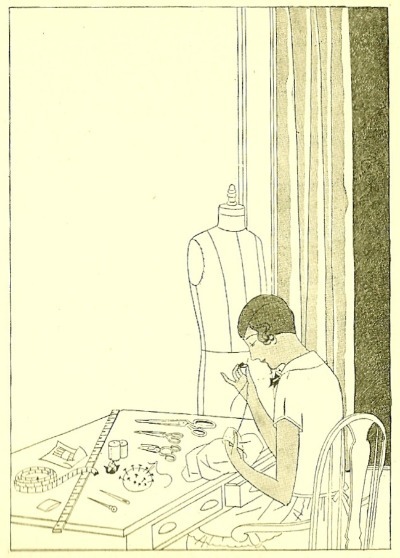 One of my favorites is The New Butterick Dressmaker, published in 1927. As I read the introduction, written by Jacques Worth, of Paris’s “House of Worth”, I am struck by how accurate it is to me, 85 years later, embarking on my “make all my own clothing” wardrobe project. I have been asked to write out of my experience in making smart clothes for women something that would be helpful and illuminating to women who want to make smart clothes for themselves. The world is always seeking a formula–for happiness, for making gold from base metals, for getting thin on sweets and cream sauces, for youth, for chic. Here, at last, is something tangible, for one can at least lay down certain rules by which chic may be attained. There was a time when interest in clothes was supposed to be the sign of a silly woman. To-day it is the woman of supreme intelligence who is well dressed. There are as many lines of character in your clothes as in the palm of your left hand. It takes intelligence to study and keep yourself so well informed that you can choose the superlatively good things that you need each season. It takes character to buy nothing else, to forego charming but unnecessary, unsuitable and inappropriate things. It takes energy an foresight to keep your clothes neat, fresh, and orderly…American women are making a study of their homes and are learning to cultivate their gardens…the time will come when the cultivation of your appearance and decorative qualities will be considered an unescapable part of your business and social obligations. This book will be read only by women who make clothes, and since making clothes is half of my business–the other half is designing them–I can give you the formula for success. The smart style. The new material in an unimpeachable quality. The chic color. Perfect workmanship. The choice of style…depends on your own capacity for study, observation, and a perfect understanding of your personal needs, both physical and social…The new material is as important as the new style. A shoddy material makes a shoddy costume. The wrong material–one that is too heavy or too flimsy, too soft or too stiff, one that won’t drape where drapery is required, one that won’t plait where plaits are needed, a material, in short, that will not give exactly the right expression to the particular style you are using–will ruin it utterly. In choosing the chic color you must rely on your own study of the latest fashion news and your choice must depend on what is new, what is suitable, and what is becoming. Black, which is almost always smart in town, is never chic in the country…Color is as complicated a matter as style. It requires constant study, for it not only changes each season but you and your make-up and your physique are changing, too. I put workmanship last, not because it is the least important, but because it follows logically the choice of style, material and color. Some one asked me once what made a French dress French. At the moment I had a frock over my arm. “This,” I said, and turned it inside out to show the beautiful, the exquisite workmanship that had woven together as if in one fabric the countless, intricate bits of material that make one of my frocks. Most women who make their own clothes do not make it their sole profession. They have their homes, their children, their social life and their sports. Their clothes making, therefore, must be done as expeditiously as possible. One must eliminate mistakes, for they mean delay and extra work. 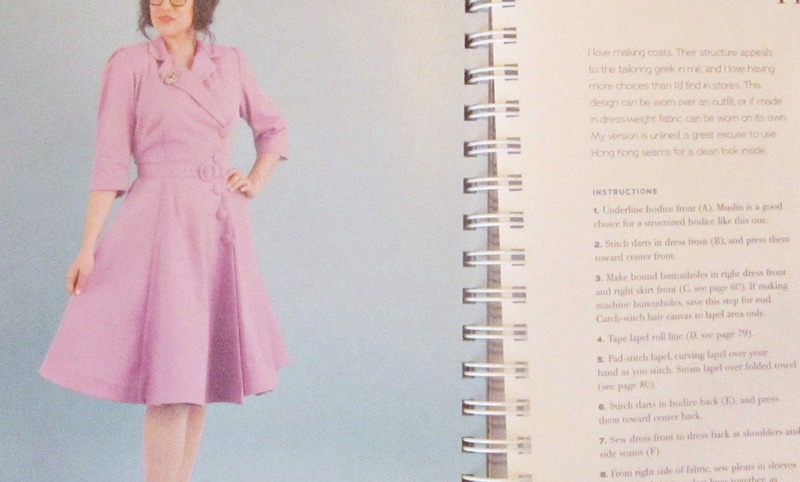 For such women a book like the New Butterick Dressmaker is absolutely essential to good workmanship in making clothes. It should be within easy reach when you are working…Some of it you will never use. Whatever you need you can turn to as you work. ..It will give your clothes the chic air of clothes that are not only well but smartly made. Discard whatever dressmaking guide you have been using, for these books are not made for the ages but for the day of the current fashion. When fashions change, methods of dressmaking change with them and you must have the new methods. The only things that do not change are dead things. Clothes are exceedingly vital and alive. And while Mr. Worth’s manual should be, by his own instruction and in spite of its lovely diagrams, discarded today for the newest methods, I think he’s exactly right about many things, from desires to get thin on sweets and cream sauces, to my not-coincidentally ever-changing physique, to the frustration and delay mistakes cause, and particularly that clothes, as well as the arts involved in making them, are, indeed, “exceedingly vital and alive”.